Boston Molasses Disaster, Deadly Molasses! The cover of The Boston Post on January 16, 1919 announcing the tragedy. Courtesy of the Boston Public Library. Ut Oh! It’s almost January and that means it’s almost time for the somber anniversary of the Boston Molasses Disaster which occurred on January 15, 1919 when a storage tank of molasses exploded in Boston. The disaster took the lives of 21 people and injured another 150. Here are some clippings from the event. More images can be found on the Boston Public Library’s Flickr page. The wreckage! Courtesy of the Boston Public Library. Grand Forks Herald (Grand Forks, ND). 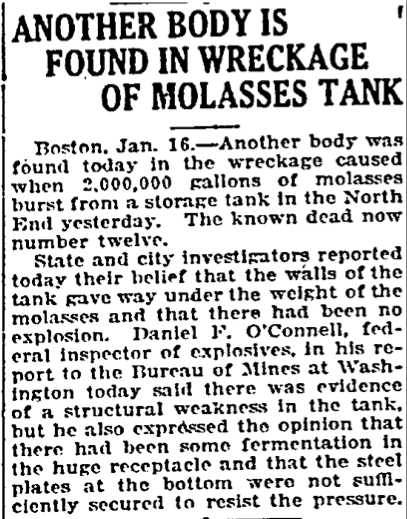 “Another Body is Found in Wreckage of Molasses Tank.” January 17, 1919, 1. Macon Telegraph (Macon, GA). “Tank of Molasses Explodes, Killing Dozen Bostonians Released by Blast, Two Million Gallons of Sticky.” January 16, 1919, 1. Philadelphia Inquirer (Philadelphia, PA). 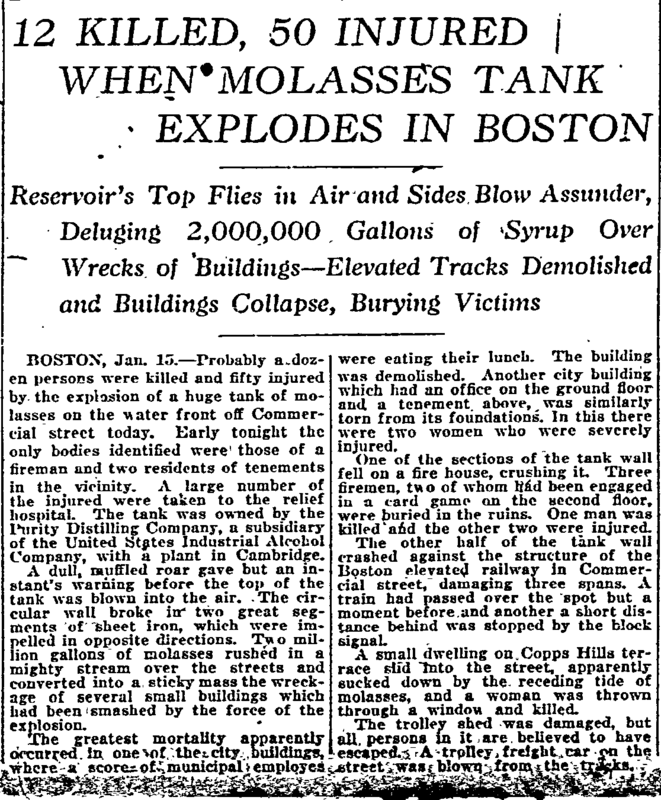 “12 Killed, 50 Injured When Molasses Tank Explodes in Boston Reservoir’s Top Flies in Air.” January 16, 1919, 1. Pueblo Chieftain (Pueblo, CO). 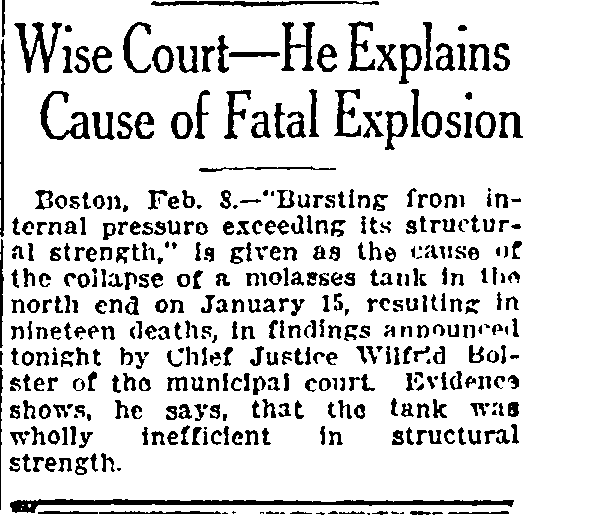 “Wise Court He Explains Cause of Fatal Explosion.” February 9, 1919. Weekly Kansas City Star (Kansas City, MO). “Die in Molasses Explosion Thirty Persons Killed in Boston When Syrup Tanks Blew Up.” January 15, 1919, 1.